How much does it cost to travel to Flanders? How much money will you need in Flanders? €94 ($105) is the average daily price for traveling in Flanders. The average price of food for one day is €31 ($35). The average price of a hotel for a couple is €101 ($114). Additional pricing is in the table below. These average travel prices have been collected from other travelers to help you plan your own travel budget. The Northern region of Belgium, commonly known as Flanders, is a popular destination for travelers. 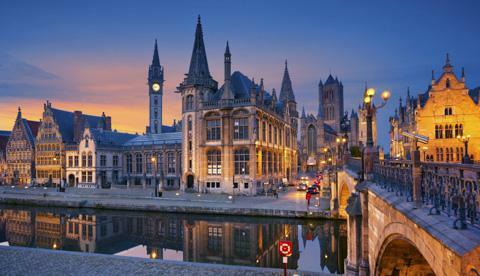 It includes well-known cities like Antwerp, Brussels, Ghent and Bruges. It is the Dutch-speaking region of Belgium and has many sights and historical attractions to see. In Bruges, one of the most famous monuments is located in the city center. It is a 13th century Belfry with 48 bells. Another place to check out is De Halve Maan Brewery, which dates back to the 16th century. Today it is an independent brewery where you can take a tour, go up onto the roof for amazing views of the city, and of course sample beers! Belgium is known for many things, one of them being beer, so this brewery is definitely worthwhile and only costs six euro to get in. In Ghent make sure to visit the medieval Gravensteen castle. It was built nine meters above ground in 1180. Today, it is open to the public to explore. There is also a museum located inside that displays many various torture mechanisms that were used centuries ago in the city of Ghent. One of the famous sights in Brussels is called Manneken Pis (loosely translated to "Little Man Pee" in English). You will find a lot of paraphernalia with Manneken Pis on it, and the best street fries you will find are named after him. You'll be surprised by the size of the famous statue! If you like street art, you'll want to visit the Brussels' Comic Book Route. It is a path where comic book art murals have been curated on the walls of many buildings. You'll see images from famous Belgian comics like, The Adventures of Tin Tin, Gaston, and Lucky Luke. In Brussels there are also many famous churches and buildings including the Grand Place in the center of the city, and the Gothic Hotel de Ville. Central Station in Antwerp is a sight to see in itself, with its glass dome and marble interior. There are several beautiful churches all over the city including, St. James' Church, Cathedral of Our Lady, and Saint Boniface Church. The Royal Museum of Fine Arts is another sight in Antwerp that shouldn't be missed for those art fanatics. This museum holds works of leading Dutch masters. There are many different cities in Flanders that are commonly traveled by foreigners. Bruges is one of these cities, located in West Flanders. The quiet cobble stone roads run along canals and old medieval buildings. Ghent is another city that is frequently visited. It is located in East Flanders and is known for its university as well as its prominent port. Brussels is the capital of Belgium, and the home of the European Union headquarters. While Brussels has been known to be a Dutch-speaking city in the past, today the major language is French. Antwerp, which is very near to the border of The Netherlands, is a city known for history in diamonds and fashion. Antwerp was a center for diamond traders, cutters and polishers centuries ago and is the home of the Royal Academy of Fine Arts. If you happen to be traveling in Flanders during the winter, the Christmas markets are not to be missed. They are usually up twice a week in the months leading up to Christmas. A notable one is in Ghent; it offers ice-skating, merry go-rounds, street vendors selling Belgian craftwork, and impeccable street food. Ollibollen is a traditional holiday treat; they are small deep fried dumplings with powdered sugar on top. Be sure to try the hot wine as well! The Flanders battlefield tour is truly an eye opening activity. The tour covers significant battlefields around the Ypres Salient and the Somme that occurred during World War One. The 2008 film titled In Bruges has brought many people to visit the city in which it was filmed. There is a walking tour that takes you to some of the sights where certain scenes were shot. Flanders is most known for its chocolate, waffles, mussels, fries, and of course beer. There are over 2,000 chocolatiers in Flanders. Leonidas is the most common one where you can buy and try almost any kind of chocolate you can imagine! Belgian waffles are all over the Flanders region; they are usually at walk-up windows where you can order to go. The same thing goes for the fries, the most common walk-up place to get fries is a chain called "Manneken Pis". They come in a cone and you can choose which kind of dipping sauce you want. The most common sauce for fries is mayonnaise, and it's a lot more delicious than it sounds! The mussels in Flanders are served with fries as well so that you have something to dip into the leftover broth. Flanders also has over one hundred breweries, with almost every type of beer you could possibly want. Most traveling to and within Flanders can be done by train. Major train stations around Europe will have trains that travel into Antwerp or Brussels. Within the country, the NMBS/SNCB travel service can take you between each city. While staying in your designated city, there are busses that run frequently. Train tickets can be purchased in the station on kiosks that offer an English option. Looking for a party? Find a hostel in Amsterdam, London, or Paris.